Cycads are an ancient group of Gymnosperms, often considered to be living fossils. Cycads originated over 290 million years ago and related to the extinct Cycadofilicales (seed ferns) from which they evolved. 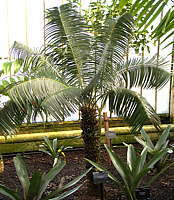 The Order Cycadales currently includes three families with living members: Cycadaceae, Stangeriaceae and Zamiaceae. 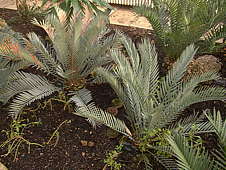 Cycads are often grown by collectors of cacti and other succulent plants. 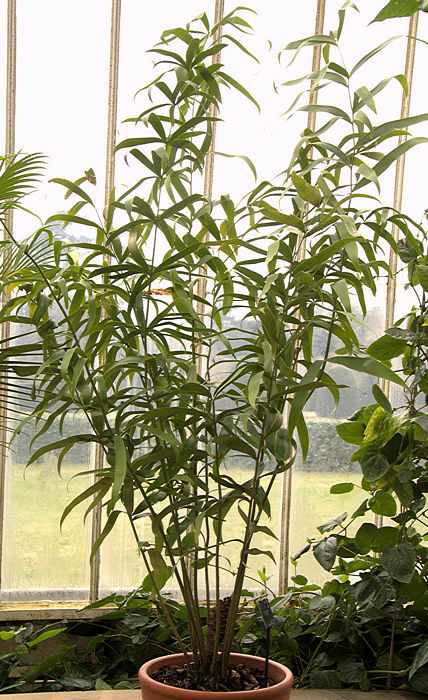 If the smaller species are selected it is possible to grow a mature plant of a reasonable size for a small glasshouse. 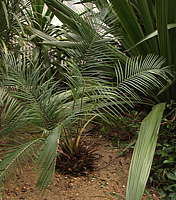 Cycads should be generally regarded as poisonous to livestock as they contain the unique methylazoxymethanol-glycoside neurotoxins Cycasin and Macrozamin. 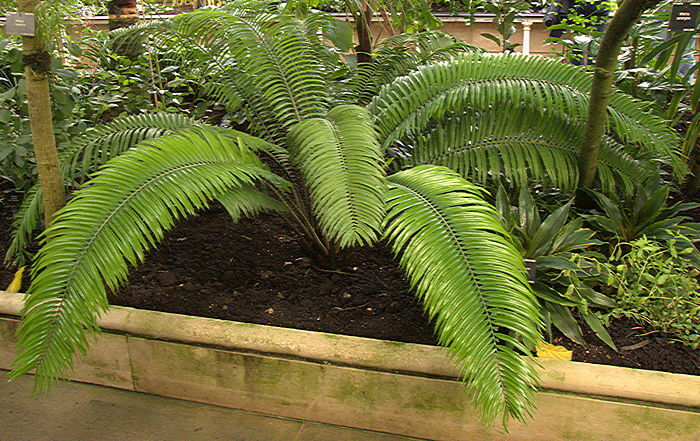 There does not seem to be a problem with growing and handling Cycads as long as no parts are eaten, although it might be wise to use gloves when cleaning the seeds, as these contain the highest concentration of toxins. Despite their toxicity, Cycad nuts, seeds or the starchy pith of some species have been used as traditional foods after thorough washing or other treatment to remove neurotoxins. Guam Dementia is a late onset neurodegenerative disease thought to be caused by consumption of flour made from improperly washed starch extracted from cycad seeds, during and after World War II when there were food shortages. 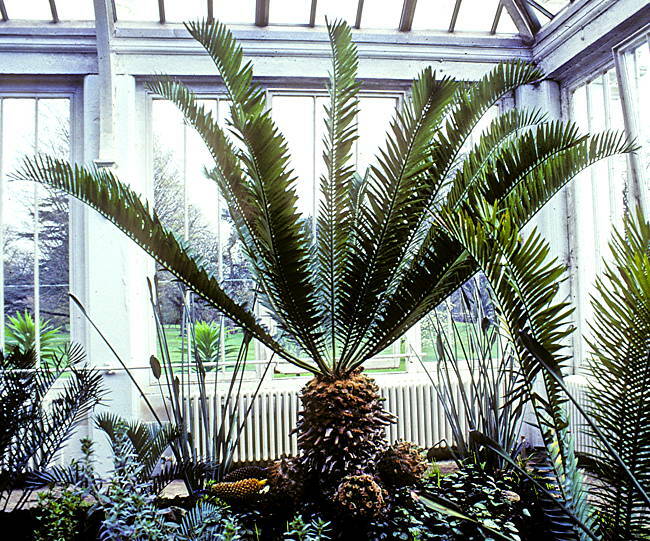 A large collection of Cycads, including the National Collection of Encephalartos, can be seen at the Royal Botanic Gardens, Kew, especially in the Palm and Temperate Houses. 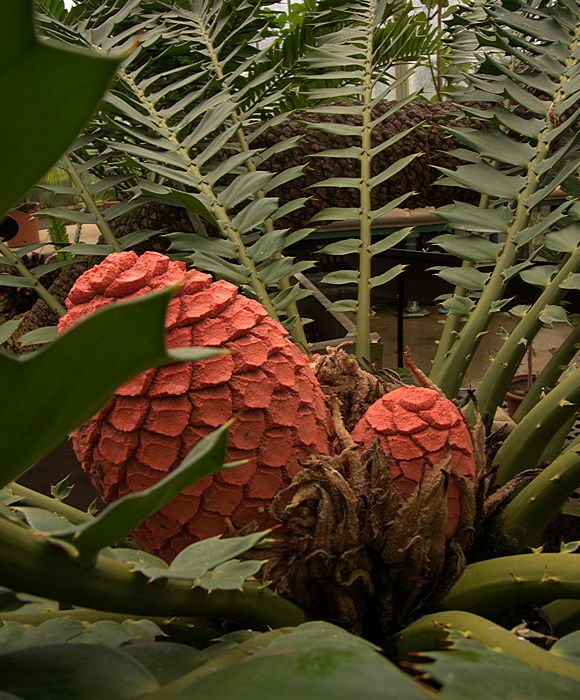 This family of Cycads appeared in the Cenozoic era over 65 million years ago, possibly diverging from the other Cycads of the Family Zamiaceae in the earlier Mesozoic. 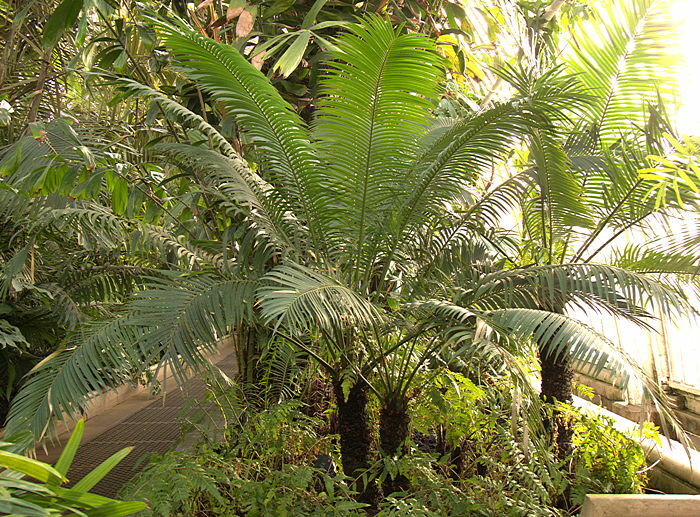 The Madagascar Sago Palm Cycas thouarsii is thought to be the oldest living Cycad, with fossils dated as 140 million years old. 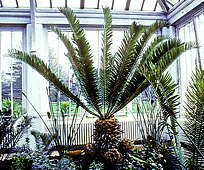 The type genus Cycas is the only genus currently recognised in the family Cycadaceae and is only distantly related to members of the other Cycad families. Cycadaceae usually have thick, pithy stems that rarely branch. However, they may offset at their base. Much of the structural support is provided by persistent woody leaf bases around the stem. 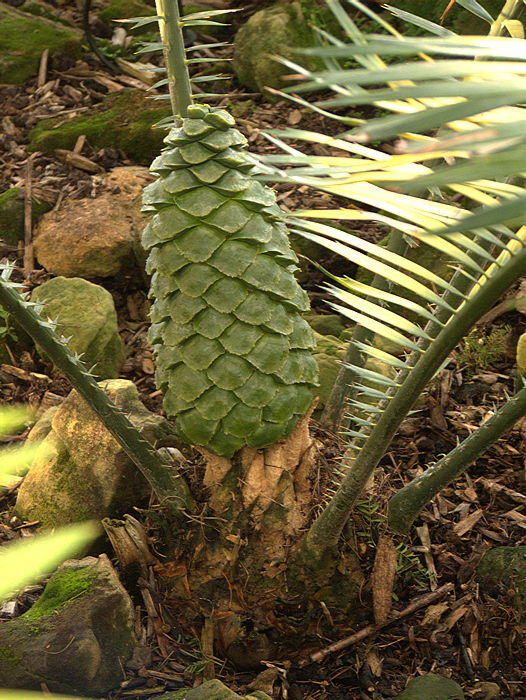 The pithy stem core stores water, entitling Cycads to be classed with succulents. The alternate pinnately-compound leaves are clustered in a spiral at the apex of the stem, each having many stiff, waxy leaflets either side of the leaf mid-rib. Leaves emerge from the apical bud with leaflets tightly coiled inwards like a watch spring. Each leaflet has a single mid-vein. 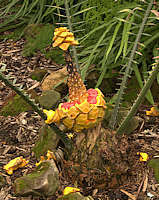 Cycads produce male cones and female ovules on separate plants (dioecious). Male plants produce cones with many scales, each of which has microsporangia (pollen) on its lower surface. 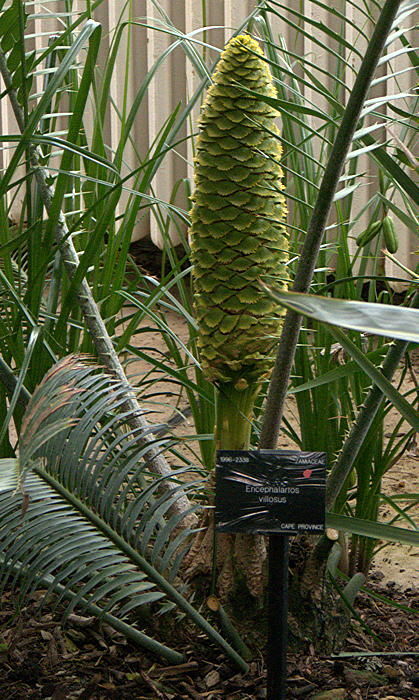 A distinctive feature of the Cycadaceae is that female plants don't form cones like other cycads. Instead they produce ovules on the lower surface of modified leaves arranged in two to three whorls at the stem apex, with up to four female megaspores in each ovule. Seeds are usually large. The type genus Cycas includes about 95 species of woody perennials with a palm-like appearance. 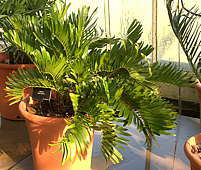 Cycads have a cylindrical caudex or trunk, sometimes almost entirely subterranean, with a spiky appearance from persistent petiole bases on its surface and with a crown of thick, hard pinnate leaves arranged spirally at its end. Young parts of the plant are hairy. The leaflets are distinctive, with a prominent midrib and without any obvious secondary veins. When leaves emerge, the leaflets are coiled like watch springs. Cycas are native to tropical and subtropical regions of the Old World. They are found in eastern and southeastern Asia including the Philippines (10 species), Eastern Africa including Madagascar, Northern Australia, Polynesia, and Micronesia, Australia (26 species), while the Indo-Chinese area (30 species). 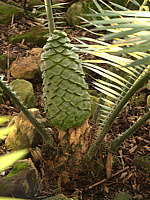 Cycads grow slowly, becoming mature and producing cones only after at least 10 years growth. 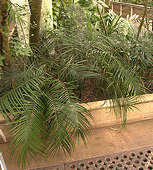 Most species are tropical and require heat to grow well. 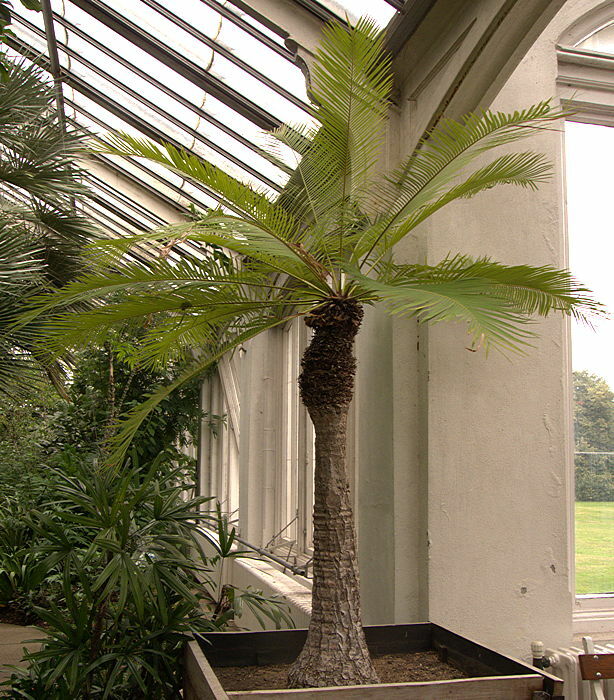 However the Sago Palm Cycas revoluta is undemanding and flourishes in a cool conservatory. 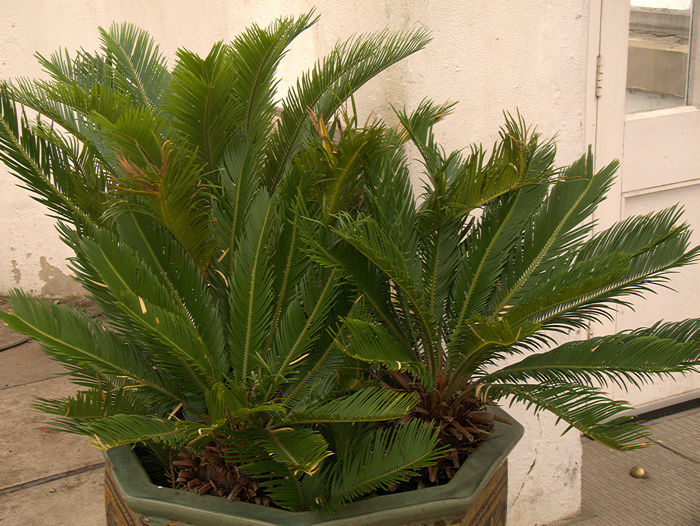 This is probably the most widely-cultivated Cycad. Its attractive feathery foliage adds an exotic touch to any conservatory. 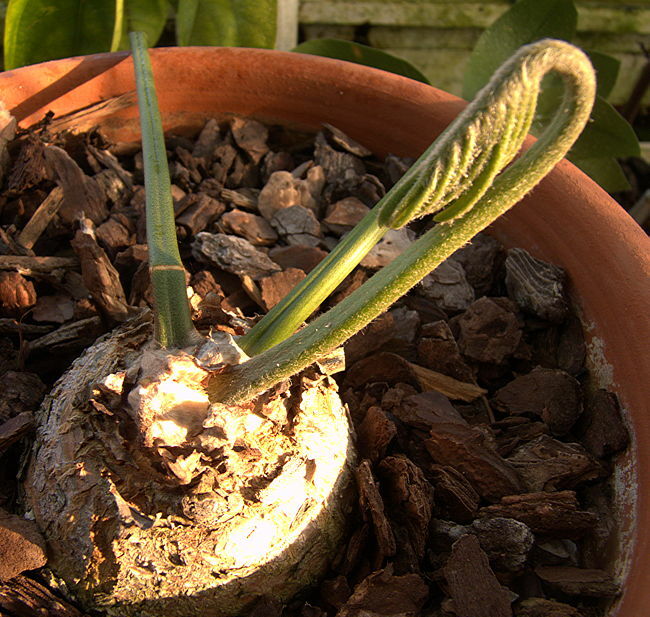 A plant should not be moved while it's leaves are unfurling as they will become distorted, and being long-lasting, will spoil the plant's very symmetrical appearance for some years. 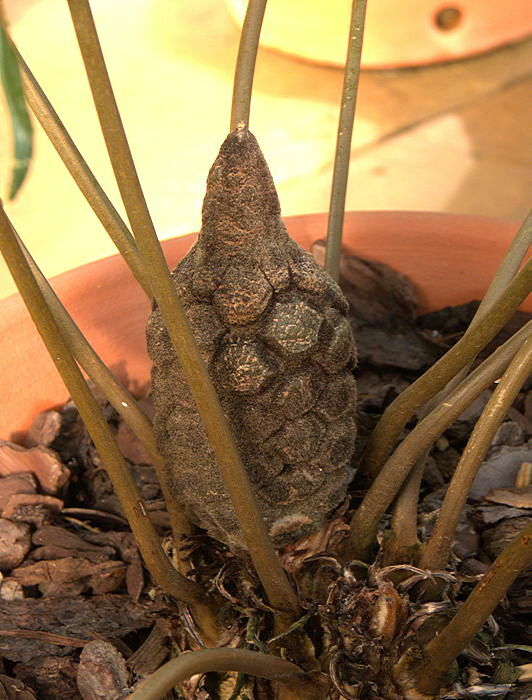 Even a small plant develops a conical caudex which, with age slowly elongates into an unbranching trunk, and may offset at it's base to form a clump. A several centuries old plant may develop a 6 ft trunk. Cycas revoluta is native to the southern Japan islands of Kyushu and Ryukyu, growing further North than any other species of Cycad. It is a very hardy plant, tolerating drought, and light frosts and is almost hardy in South-East England through an average Winter. 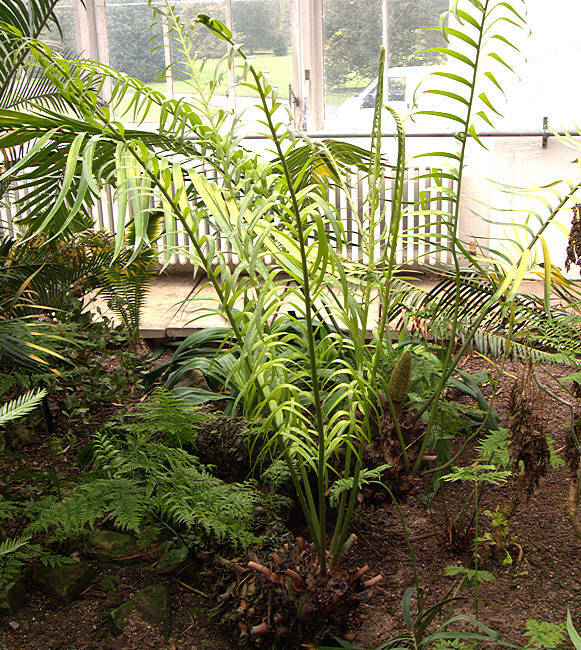 Several specimens survive planted in sunny corners outside the Temperate House in Kew Gardens. 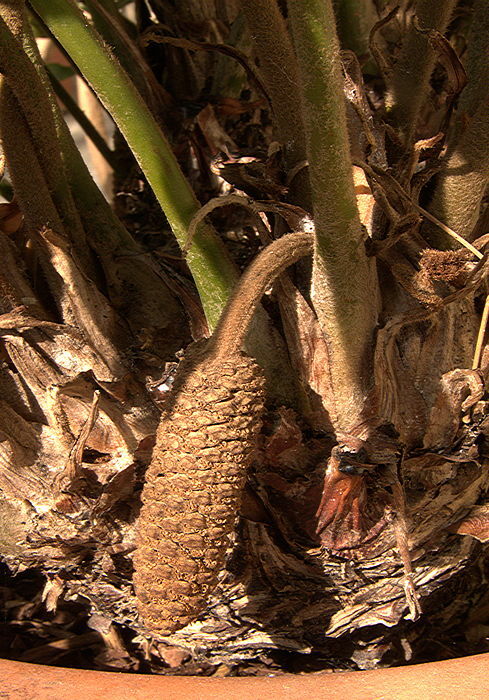 All parts of the Sago Palm Cycad are extremely poisonous to animals if ingested. The seeds contain the highest level of the toxin Cycasin and other harmful metabolites. This Cycad produces flat leaves whose colour (silvery-white, yellow, orange, brown) depends on the colour of hairs on the leaves. 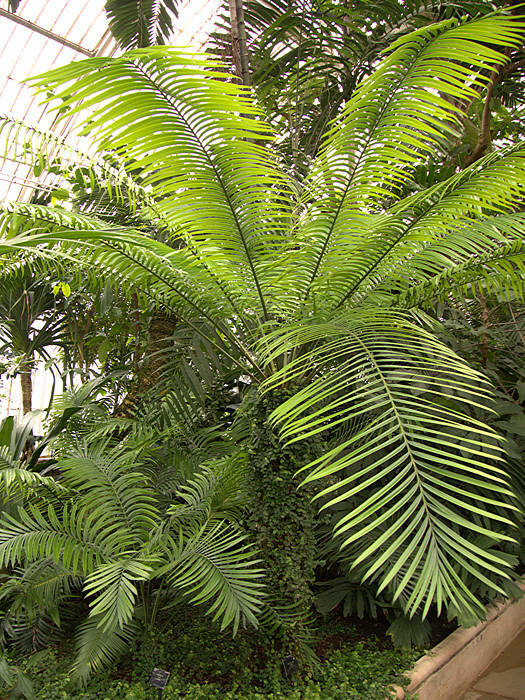 This Cycad has a stout trunk over 30ft tall topped with a crown of up to 40 feathery pinnate leaves. Offsets may be produced along the length of the trunk. Native to coastal Kenya, Tanzania and Mozambique, Madagascar, Comoros Islands and introduced into the Seychelles. 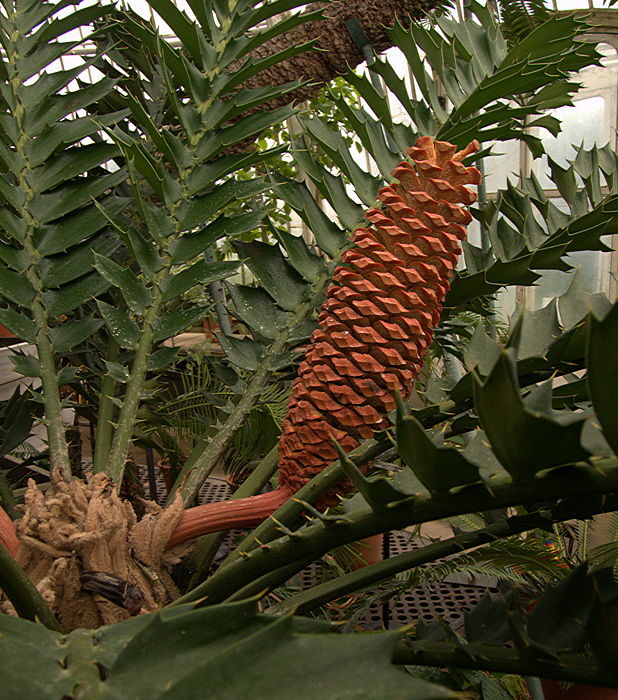 This Cycad probably originated over 140 million years ago and may be the most ancient living species. It is relatively fast-growing, tolerating light frosts. 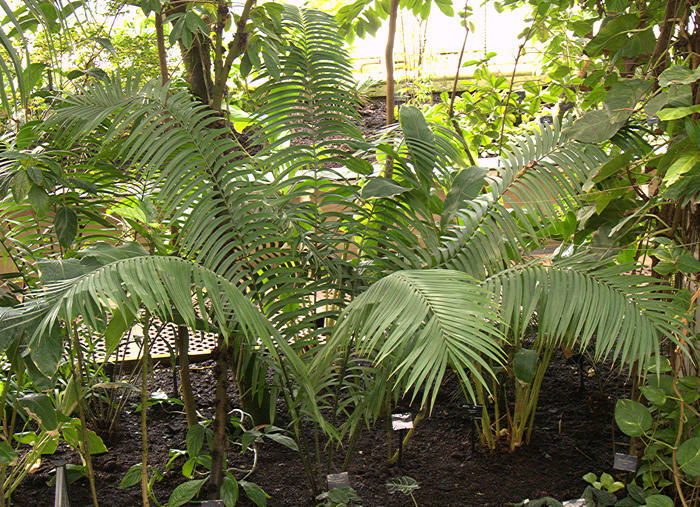 a small family of Cycads in which the genus Bowenia (2 living species) is sometimes placed. The Boweniaceae are distinguished by the unique branching midrib (rachis) of their leaves. Named for: Sir George F. Bowen 1821-1899 first governor of Queensland. 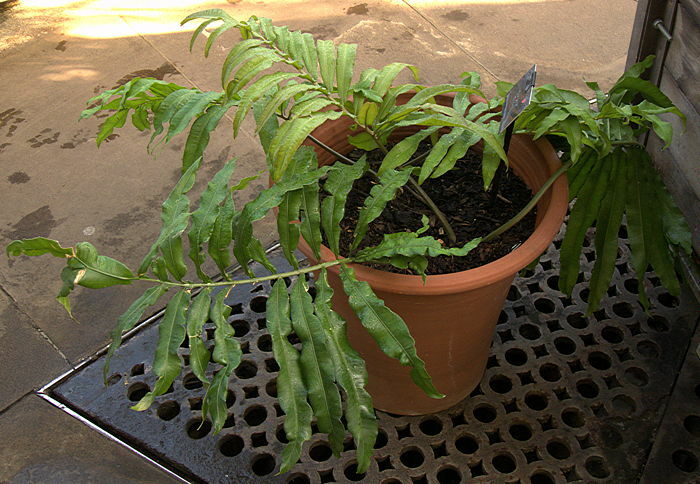 The genus Bowenia includes two living species of small fern-like shrubs from Eastern Queensland, Australia. This genus is variously included in its own family Boweniaceae or with the Stangeriaceae or Zamiaceae. The leaves are bipinnate with leaflets lacking a midrib and not articulated. Two additional species in the fossil record are known from Australian coal deposits. Name: Latin serrulatus = serrated or toothed, referring to the leaf margins. The 10 - 12 in globular subterranean stem produces up to 20 branching bipinnate leaves 4 - 5 ft tall, whose leaflets with finely-serrated edges. The stem has a large tap root. Native to warm, dry Eucalyptus forests of Eastern Queensland where it grows as an understorey plant. The type species for the genus, native to subtropical moist forests in North-Eastern Queensland. The underground stem produces up to seven 4 - 5 ft branching, bipinnate leaves whose leaflets have smooth margins. 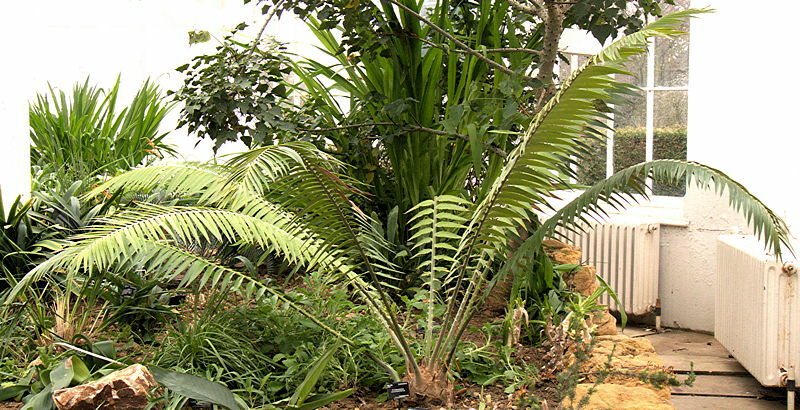 a small family of Cycads with the genus Stangeria (1 living species) and sometimes including the genus Bowenia (2 living species). Distinctive features of the family are vascularised stipules and almost complete absence of cataphylls. Bowenia may be destined for its own separate family Boweniaceae. Named for: Dr Max Stanger, Surveyor General of Natal province, South Africa, who collected a specimen in 1851. 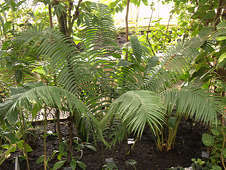 Stangeria is monotypic for the fern-like cycad Stangeria eriopus, although the fossil record suggests that this genus was once distributed globally. Name: Greek erio = woolly + pus = footed, referring to the woolly petiole base. The thick stem is subterranean, with a tap-root and corralloid roots near the surface housing nitrogen-fixing cyanobacteria. The stem is crowned with distinctive pinnately-veined, fern-like leaves. 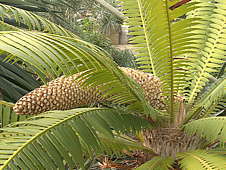 Indeed this Cycad was originally described as a fern (Lomaria eriopus Kunze 1839) and the mistake only realised when seed cones were observed. 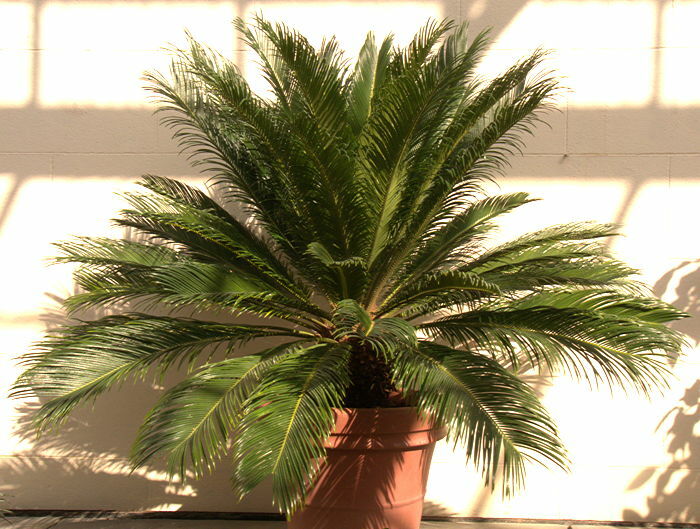 This variable Cycad has a forest form (above) bearing soft, thin, wide 6ft leaves and a more compact form (below) from open grassland with smaller, thicker 1ft long stiff leaves. 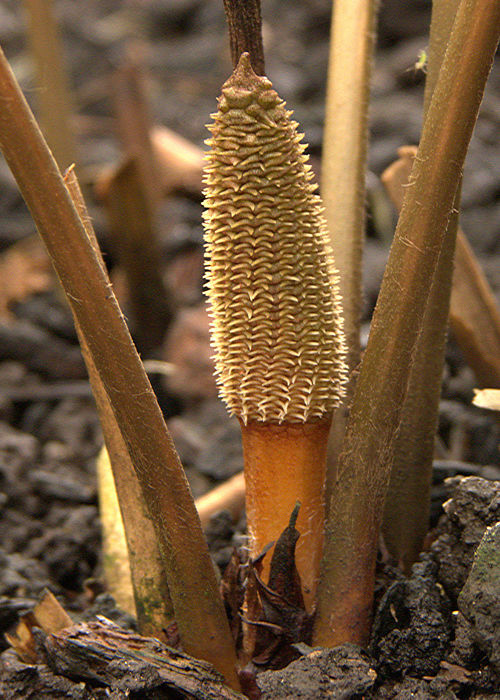 Stangeria eriopus matures relatively quickly for a Cycad, usually after 5 - 7 years, from which time male and female stalked cones are produced on separate plants. The cones produce a perfume to attract beetle pollinators. Stangeria eriopus hard-leaf form. Left: grown in shade. Centre, Right: grown in strong light. 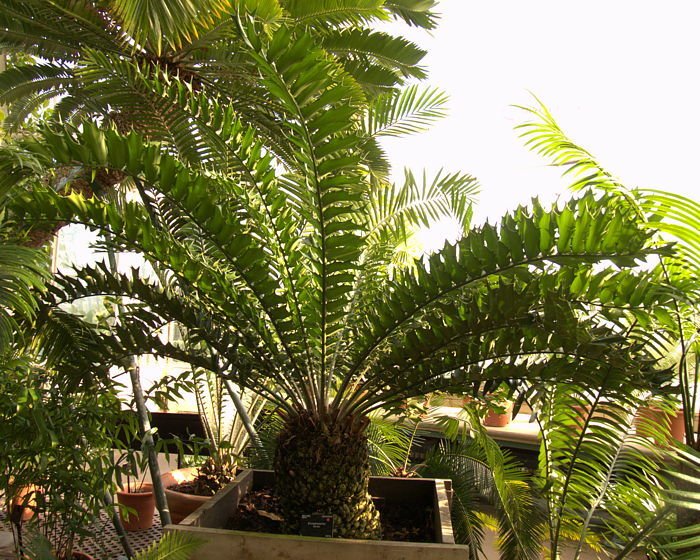 is an ancient family of Cycads originating over 290 million years ago, related to the extinct Cycadofilicales (seed ferns) from which they evolved. 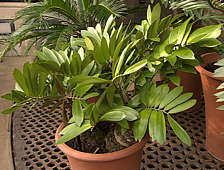 Zamiaceae includes the genera (Bowenia,) Ceratozamia, Dioon, Encephalartos, Lepidozamia, Macrozamia, Microcycas and Zamia. 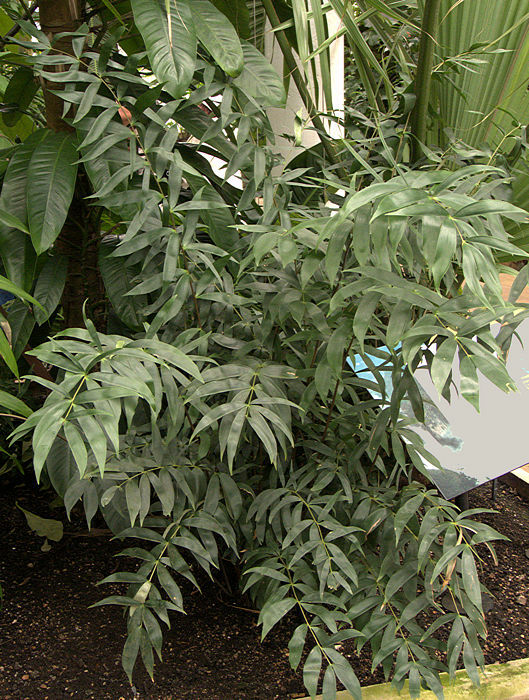 Zamiaceae are palm-like trees and shrubs, with thick, pithy stems that rarely branch. However, they may offset at their base. Much of the structural support is provided by persistent woody leaf bases around the stem. The alternate pinnately-compound leaves are clustered in a spiral at the apex of the stem, each having many stiff, waxy leaflets either side of the leaf mid-rib. Leaflets are flat while expanding and usually have numerous parallel veins. 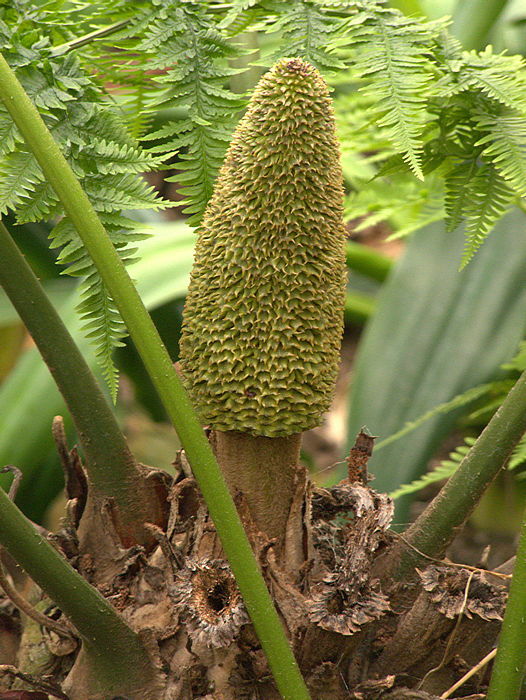 Both male and female plants produce cones (dioecious). Male plants produce cones with many scales, each of which has microsporangia (pollen) on its lower surface. Female plants produce cones with many highly modified megasporophylls, each bearing 2 ovules. Seeds are usually large. Name: Greek ceras = horn, referring to pairs of horny spines on the sporophylls. 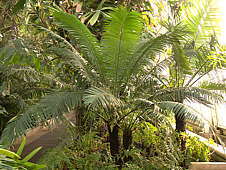 The genus Ceratozamia includes 26 living species of cycads native to forested mountains of Mexico, Belize, Guatemala and Honduras. A cylindrical or globular stem which may be mainly underground or above ground produces pinnately-compound leaves arranged spirally on the crown. Some species spread via basal suckers but the trunk rarely branches. Leaf petioles are often furnished with spines. Upright male and female cones are produced on separate plants and may be hairy. The oblong seeds have a white, fleshy coat. 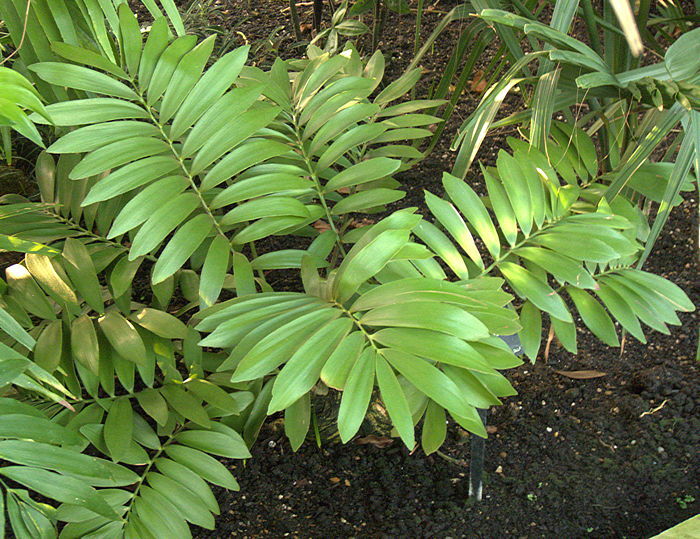 As natural understorey plants, Ceratozamia appreciate shade. The genus includes species with narrow, thick leaflets from drier areas with seasonal moisture and broad, thin leaflets from tropical rainforest. Many species will survive at least light frost. Some are very cold-hardy. There are at least two fossil species in this genus. 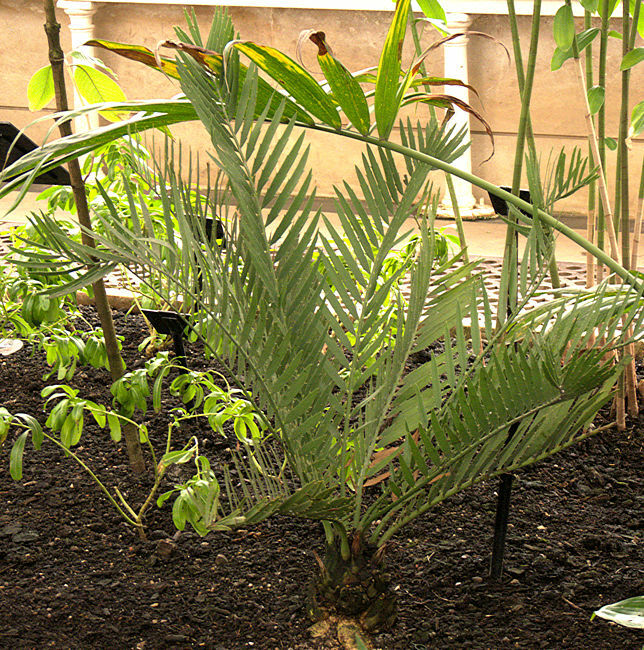 Named for: Hilda Guerra Walker daughter of Luciano Guerra who first collected this Cycad in 1959. 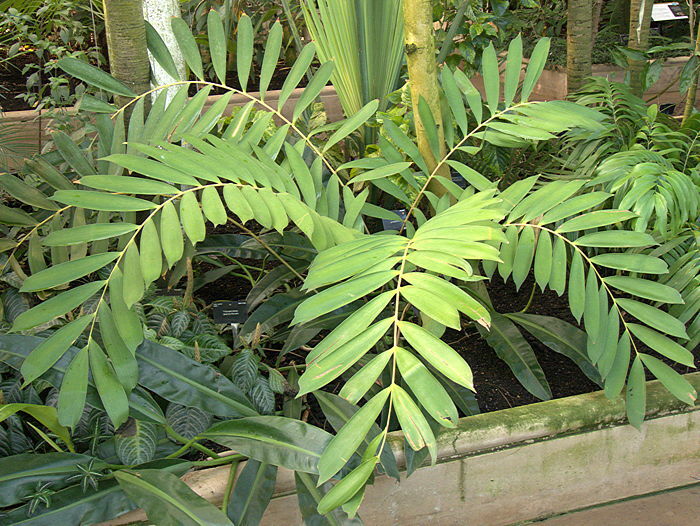 This small Ceratozamia has 3 - 4 ft leaves whose leaflets cluster in groups of two or three pairs either side of the midrib, looking like a string of bow ties. The subterranean trunk offsets to form a clump. Native to deciduous oak cloud forests on limestone soils in the Mexican states of Querétaro and San Luis Potosí, but almost extinct in its habitat. 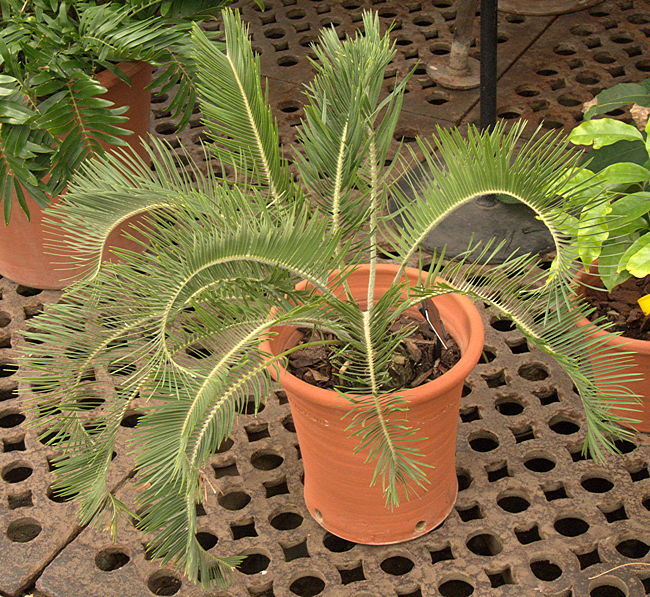 This shade-loving Cycad is relatively fast growing and popular with collectors. Growing naturally at elevations up to 4500 ft, it is said to be frost tolerant. Named for: Baron Karl von Küester (1820 - 1893), Administrator & Head of St. Petersburg's Botanical Garden. 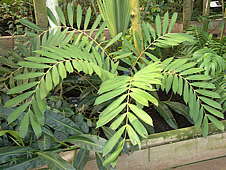 This small Ceratozamia has a globose mostly subterranean trunk producing 3 - 4 ft dark-green leaves with smooth petioles and many narrow drooping leaflets. New leaves are coloured bronze. Native to pine & oak cloud forests at elevations of up to 6000 ft in a limited range of the Sierra Madre Oriental Mountains of the Mexican state of Tamaulipas. 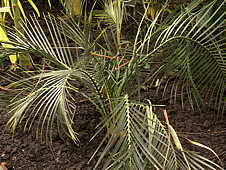 Ceratozamia mexicana is the type species of the genus. It has a large prostrate stem, offsetting at the base to make a large clump. New leaves are hairy and may be bronze to light green in colour. The petioles are spiny as are the large cones. Native to wet and dry forests of mountains in the Mexican state of Veracruz. 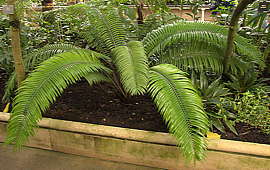 This small Cycad has a mainly subterranean or prostrate stem which produces 6ft spreading pale glaucous green pinnate leaves with broad, pointed leaflets. Native to the Mexican states of Chiapas, Tabasco (extinct) and Veracruz, where it grows at moderate altitudes in cool, moist rainforest. Habitat destruction and collecting threaten the survival of this species. 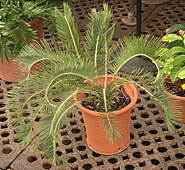 This is not a frost-tolerant Cycad although the subterranean stems may survive light frost. 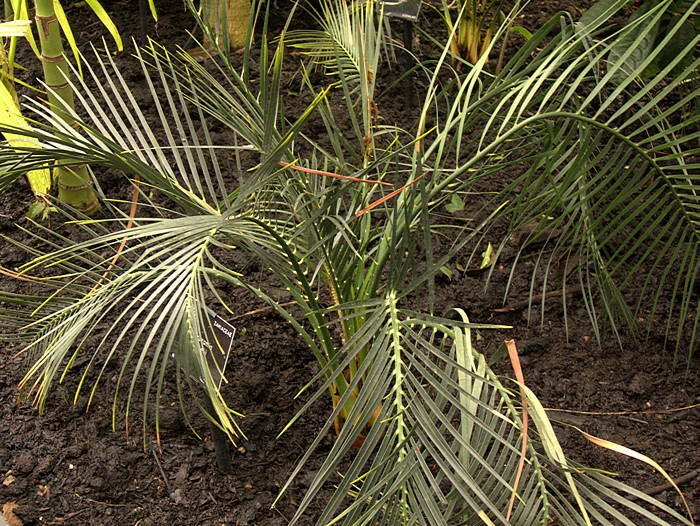 This is the largest Ceratozamia species. It develops a 6ft trunk crowned with dark-green pinnate leaves up to 8 ft long, with up to 200 narrow leaflets and a spiny petiole. Native to the Mexican states of Chiapas, Oaxaca and Veracruz, Belize and Guatemala where it grows as an understorey plant in warm, humid forests. Name: from Greek for "two + egg" referring to the seeds borne in pairs. The genus Dioon includes 11 species of Cycads from Mexico, Honduras, and Nicaragua. 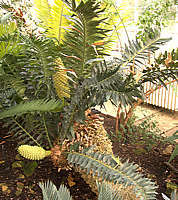 These Cycads are palm-like trees with stout cylindrical stems supporting a crown of many spirally-arranged pinnate leaves. Name: refers to former use of the seeds to make flour for tortillas. 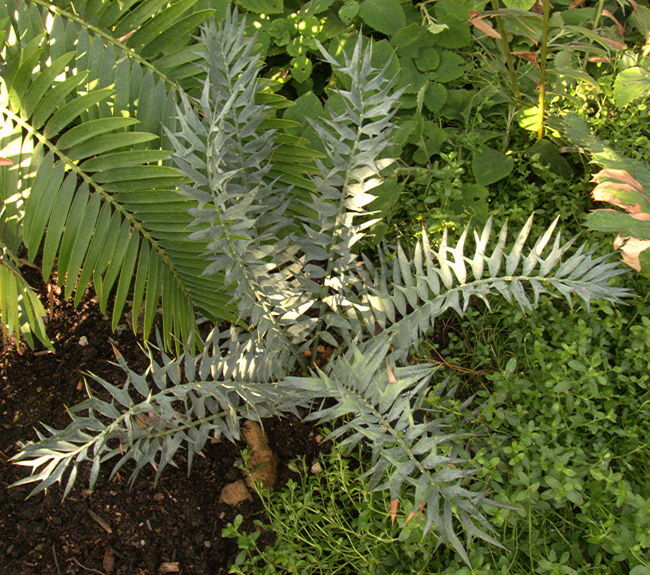 Dioon edule has a short trunk up to 10ft tall, bearing a crown of stiff, upright, bipinnate blue-grey leaves with a feathery appearance. 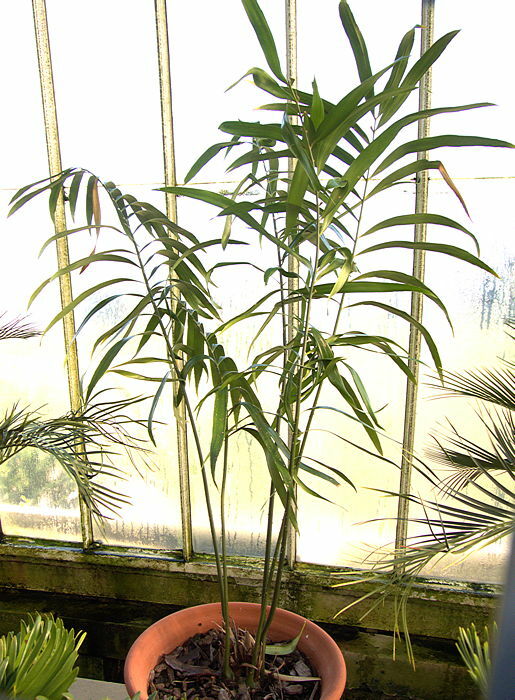 Leaflets on young plants have spines but these are absent in mature plants. However, the leaflets still have sharp tips. Offsets may be produced at the base of the trunk. A drought-resistant plant native to arid parts of Eastern Mexico, Honduras and Nicaragua. This is a beautiful plant for landscaping in suitable climates and tolerates light frosts but probably not cold-wet winters. Despite former use as a food plant, all parts including the seeds are poisonous. This is one of the tallest Cycads in the world, potentially reaching heights of 50ft. The pinnate leaves have 140-240 leaflets which have small marginal thorns and are tapered to a sharp point. The cones are the largest of any known plant. Native to the states of Veracruz and Oaxaca Mexico where it grows in tropical rainforest on limestone soils. This species is not hardy but will tolerate occasional light frosts. 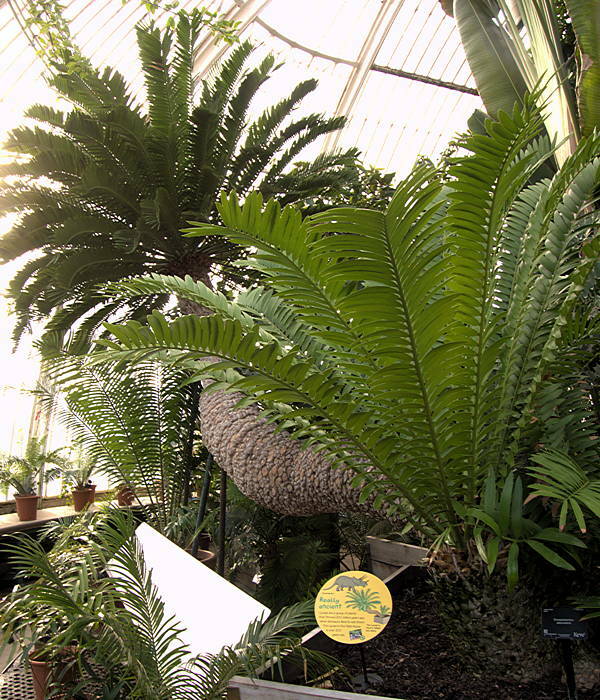 The genus Encephalartos includes 68 species of African Cycads, primitive Gymnosperms. The majority of species are in Southern Africa with 37 species found in South Africa. A few species are found in Angola, Benin and Ghana. 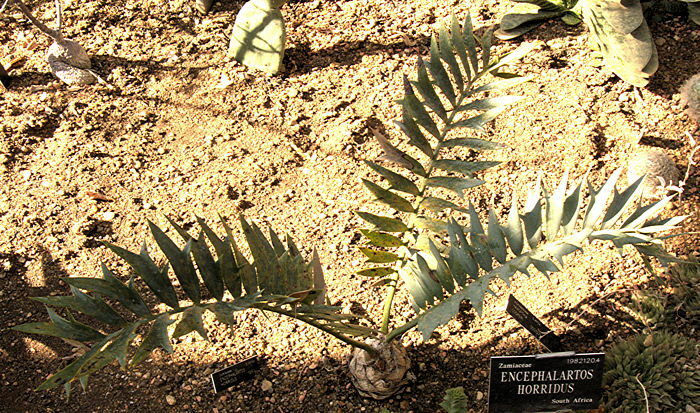 All species of Encephalartos are endangered. The starchy pith in the centre of the stem of several species of Encephalartos can be used to prepare a native bread, hence the common name. Toxins in the pith are destroyed by prolonged burial in the ground. 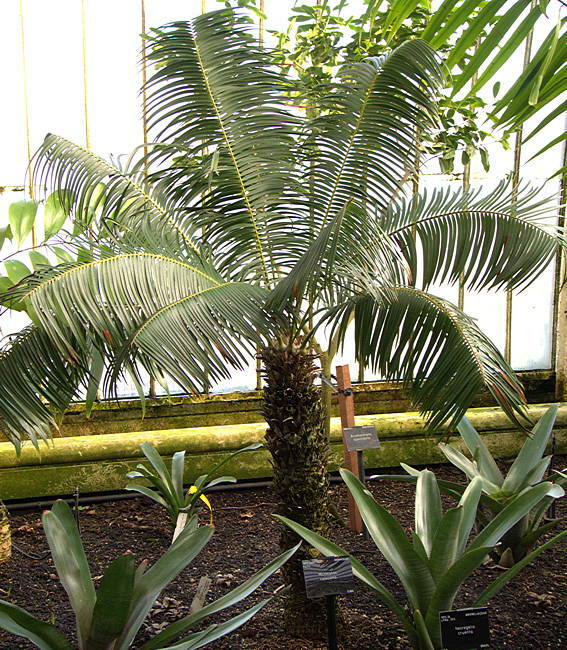 The Royal Botanic Gardens, Kew houses the National (UK) Collection of Encephalartos. Named for: Baron von Stein zum Altenstein, Prussian statesman. 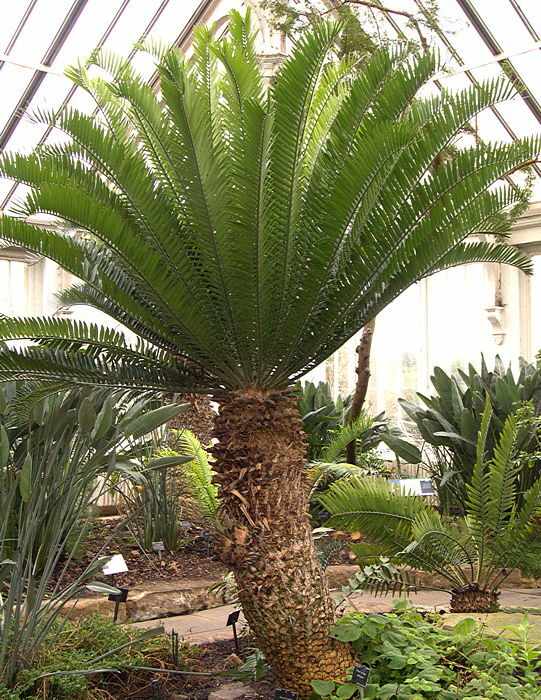 This large impressive Cycad has a single erect trunk up to 15ft tall, often suckering at the base to form a clump with age. 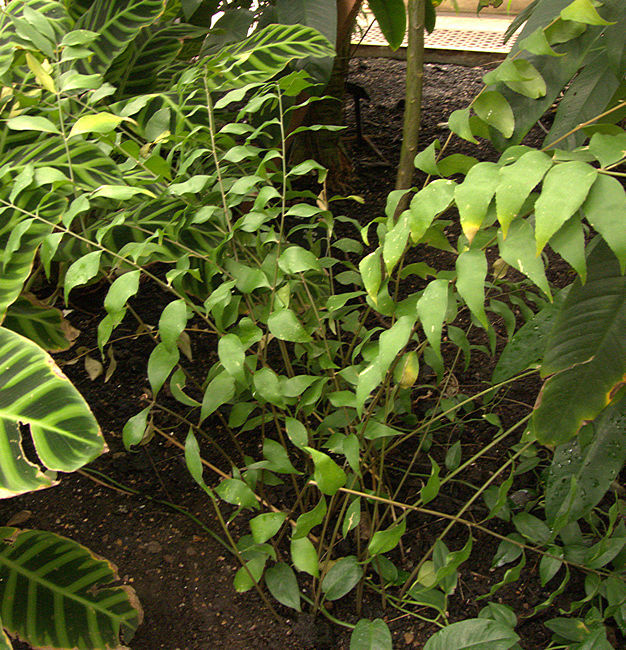 The pinnate 10ft long, deep green glossy leaves are long-lived, but a new flush of leaves is produced in the Spring. The broad, well-spaced leaflets have 1-3 prickles on their margin, but basal leaflets do not merge into spines leaving a short length of bare petiole. The midrib of the leaf is straight, not twisted.There is no wooly fibre in the crown around new leaves. 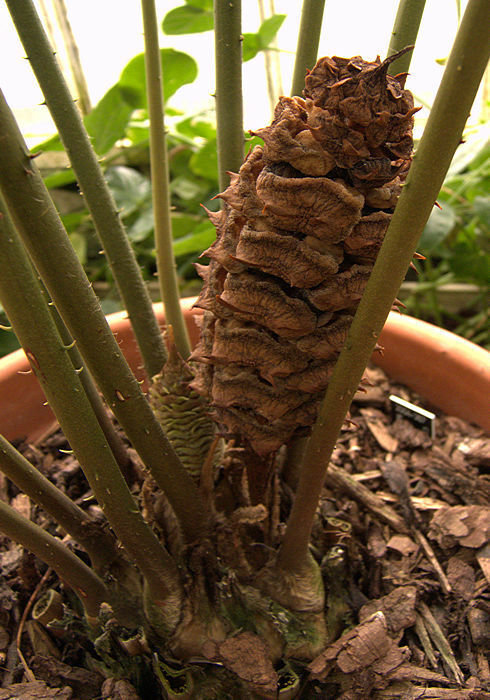 Yellowish male and female cones are produced at the stem tips of separate plants. 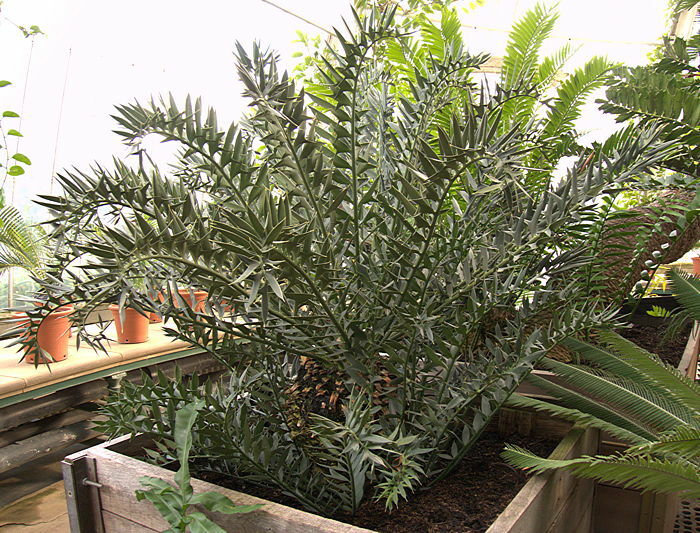 Encephalartos altensteinii is native to the South-Eastern Cape of South Africa, a Summer rainfall area and a guide to watering the plant. It is commonly grown in tropical gardens, but is very slow-growing. It will not stand more than the lightest frost. 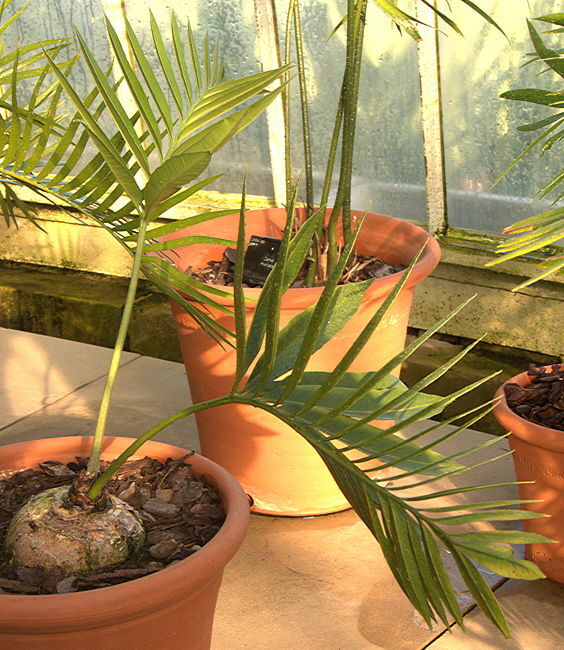 Left: This huge multi-stemmed E. altensteinii in the Kew Palm House arrived at Kew in 1775 and is claimed as the oldest pot plant in the world, although by no means the oldest specimen in cultivation. 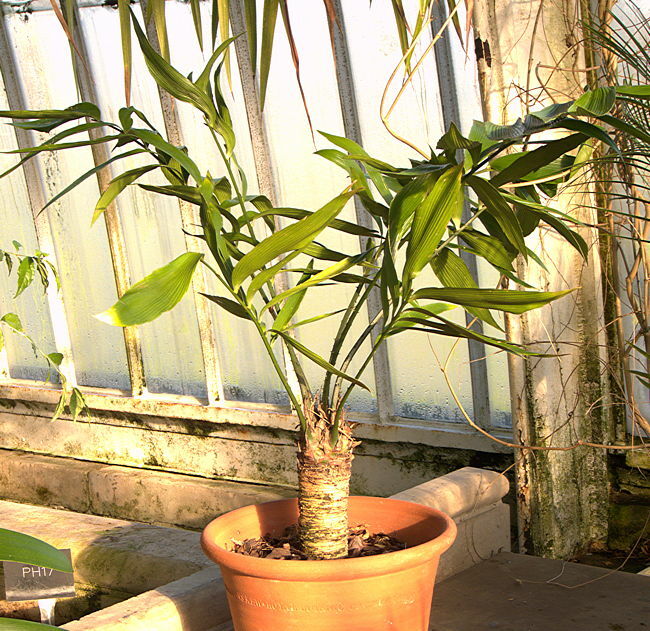 A specimen of E. altensteinii in Lednice Greenhouse, Czech Republic is 400 - 500 years old. 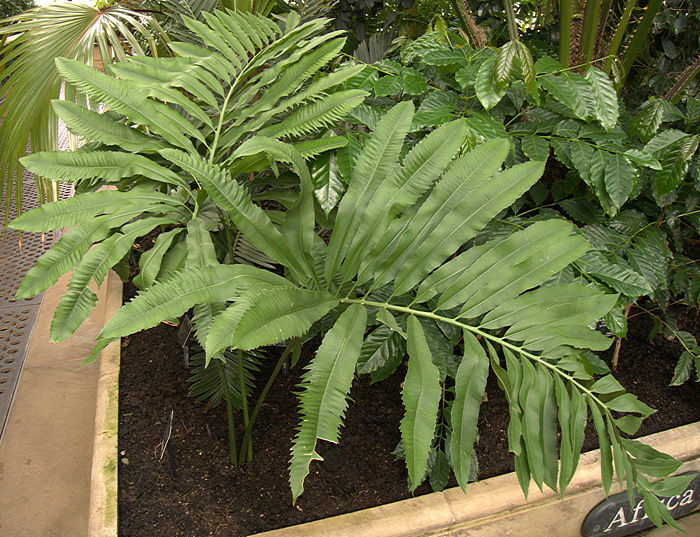 Encephalartos arenarius has a stout 4 ft stem that may be either subterranean in leaf litter or prostrate. The plant clumps up by offsetting at the base. The 4 ft pinnate leaves are recurved at their ends and consists of many broad, hard leaflets with prickly lobes. Two forms of E. arenarius are known with either dull green or bluish leaves. Native to coastal sandy dune forest around Alexandria in the Eastern Cape of South Africa, although much habitat has been lost from conversion to pastures. The mainly subterranean main stem produces 3ft pinnate blue-green leaves. The leaflets form a V-shape on the mid-rib and are reduced to vestigal prickles on the petiole. They have 4 - 6 spines on each margin. The cones are greenish. Native to the Eastern Transvaal Drakensberg escarpment, occurring as small populations. Plants may clump up by suckering. Name: Latin ferox = ferocious, referring to the rigid, spiny leaflets. This medium sized Cycad has a stout 3 - 4 ft long trunk which can be mostly subterranean, pulled down by contractile roots. The pinnate leaves have hard ovate blue-green leaflets with spine-tipped lobes, forming a shallow V-shape along the mid-rib. Left: The male and female cones on separate plants are a dark salmon-pink. 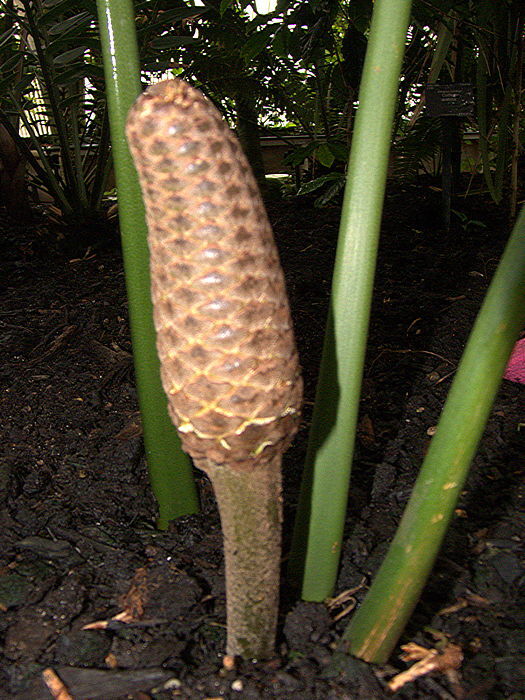 The male cone is an elongated cylinder narrowing at each end and the female cone is egg shaped. 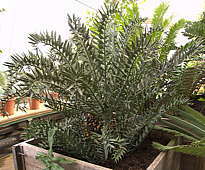 Encephalartos ferox is native to coastal Mozambique and Natal where it grows on sand dunes and evergreen forests. The starchy pith has been used to make a flour after fermentation to remove toxins. 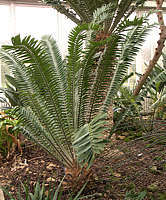 This low-growing Cycad has the majority of its large 3ft long stem underground, although more may be exposed when growing in rocky terrain. Two forms are recognised: a robust form and a dwarf form with shorter stems and smaller leaves. 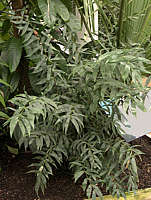 The freely-branching stem is crowned with 4 - 8 stems of distinctive blue-grey leaves with stiff, spiny leaflets. After becoming mature, each crown of the plant produces a single brown or dark red cone covered in fine hair. Female cones are egg-shaped and male cones cylindrical with narrow ends. 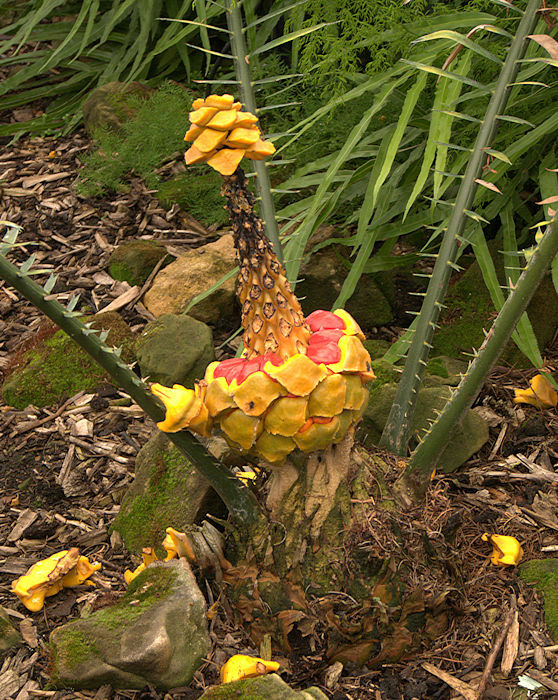 Female cones produce toxic seeds surrounded by a fleshy skin which is eaten by birds and monkeys, while discarding and dispersing the more toxic seeds. Native to the Eastern Cape of South Africa around Port Elizabeth and Uitenhage, growing on acidic soils. Because of its unique appearance, natural populations have been depleted by over-collection. Not cold-hardy but may tolerate brief, light frosts. 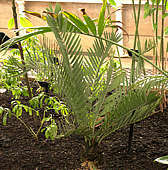 This medium-sized Cycad has a globular caudex becoming a thick 4ft tall stem with great age. The stem bears many leaf scars and is crowned with blue-grey 3ft leaves which are covered in silver hairs when young. The leaflets for a V-shape along the mid-rib and the leaves tend to recurve. The cones are also covered with persistent silvery hairs. Native to limited locations in the Transvaal at altitudes of 4000 - 5000 ft. 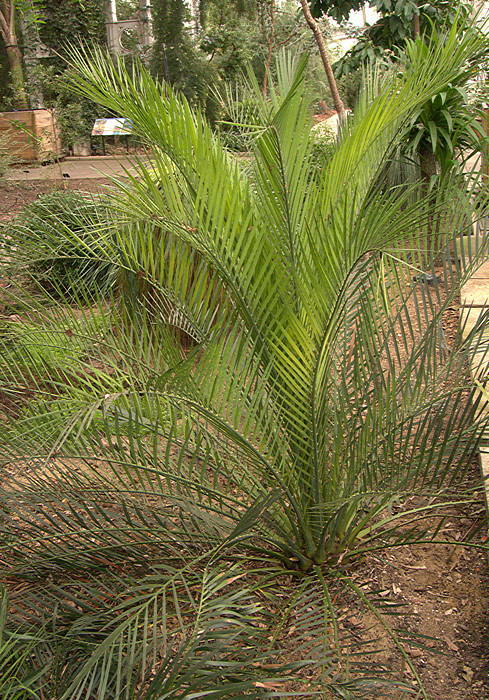 This slow-growing Cycad is frost hardy and adapted to both drought and bush fires but dislikes too much water. Named for: Professor J.G.C. Lehmann of Hamburg who erected the genus. 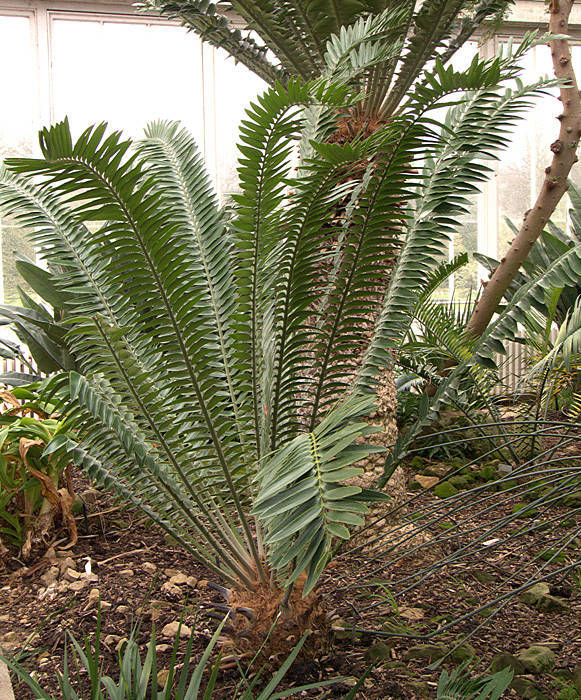 This Cycad has a stout trunk up to 6ft tall, crowned with a whorl of beautiful feathery blue leaves 3 - 4 ft long. The stems clump up from the base. Native to the Eastern Cape Province of South Africa. One of the most drought resistant Cycads and tolerates a degree of frost. The thick trunk up to 15ft tall, produces a crown of glossy, dark-green leaves curving outwards towards their ends. The lanceolate leaflets are arranged on the mid-rib in a distinctive V-shape. Their lower margin may have a small number of teeth. This species clumps up by offsetting from the base. 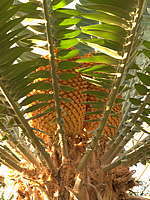 The large olive-green female cones are the heaviest of any Cycad. 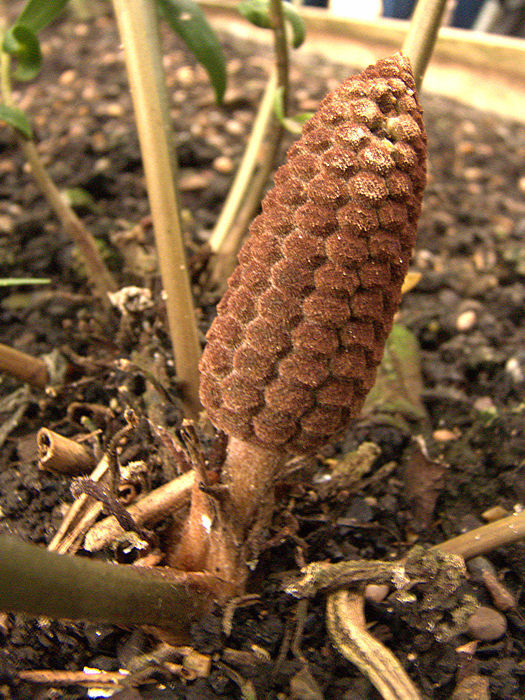 Male cones are brownish. The seeds are very toxic. Native to the Eastern Cape. The starchy pith was fermented to remove toxins and used to make a flour. 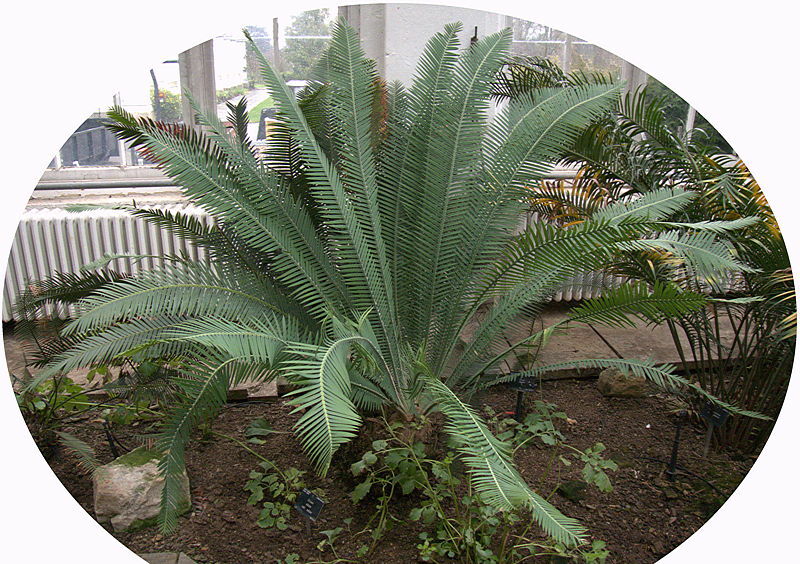 One of the first Cycads to be discovered by the Swedish botanist Carl Peter Thunberg and Francis Masson in 1772. The stout trunk can grow 20ft tall and is crowned with 10 ft long pinnate leaves with many well-spaced bright-green ovate leaflets, usually but not always without marginal prickles. Basal leaflets are reduced to spines along the petiole. New leaves and cones are covered in yellowish hairs. The cones are yellow and ovoid. Female cones contain toxic red seeds. Native to the Eastern Cape Province and KwaZulu-Natal. The starchy pith of the trunk was processed into a flour. 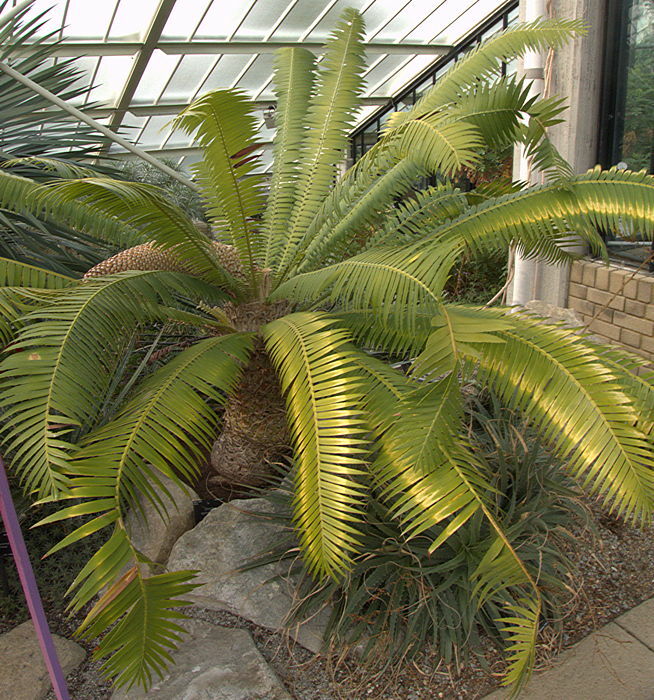 This Cycad is closely related to E. altensteinii. The stout upright or procumbent 20ft trunk produces a crown of glossy green leaves which are covered in brown hairs when young. Individual leaflets are relatively large and lanceolate with few marginal teeth. The cylindrical golden cones are probably pollinated by snout beetles. Native to mountains of Eastern Mpumalanga, RSA, near Barberton and mountains of North-Western Swaziland. This dwarf species has an almost entirely subterranean stem, it's crown supporting spreading 10ft pinnate glossy dark green leaves. The leaves are covered with white hairs when freshly unfurled. Male plants can produce up to 5 yellowish elongated cylindrical cones with an unpleasant odour when mature. The odour attracts a specific pollinator weevil Antliarhinus zamiae. Female plants have deep yellow ovate cones, developing fleshy dark red seeds that are eaten and distributed by birds. Encephalartos villosus is native to the Eastern Cape of South Africa where it is common, although somewhat depleted by collection and clearance for agriculture. 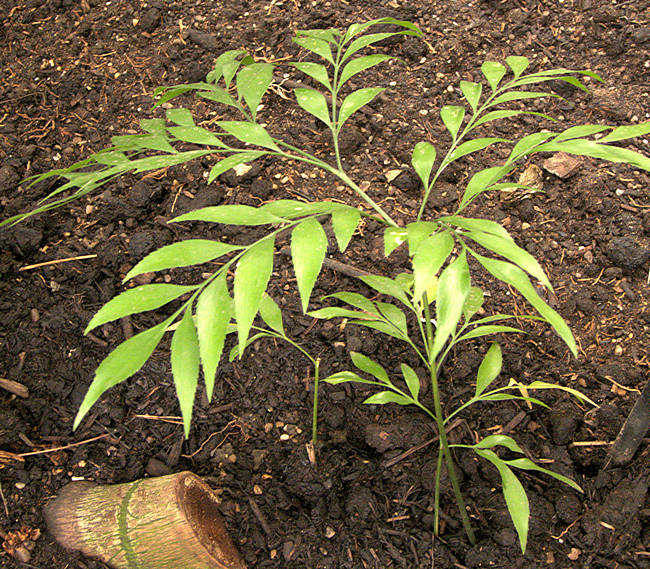 This shade-loving plant typically grows as an understorey plant in forests experiencing Summer rainfall. Old speciments form multi-headed clumps. 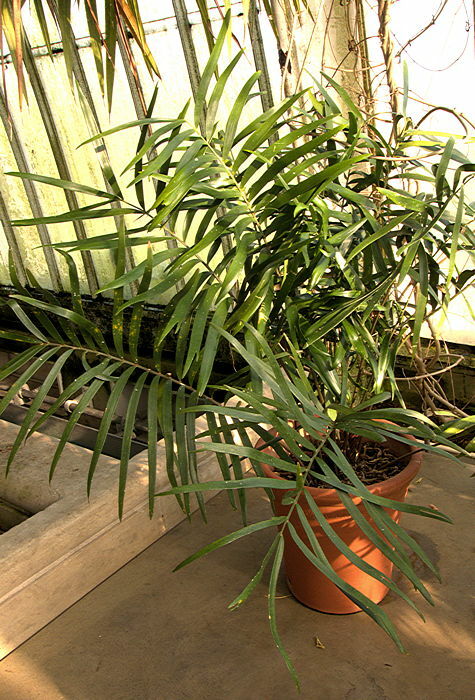 It is commonly cultivated as a dwarf ornamental plant for landscaping and conservatories. Named for: John Medley Wood, curator of the Durban Botanic gardens, discoverer of this species. This is a very rare plant, possibly originating as a hybrid. 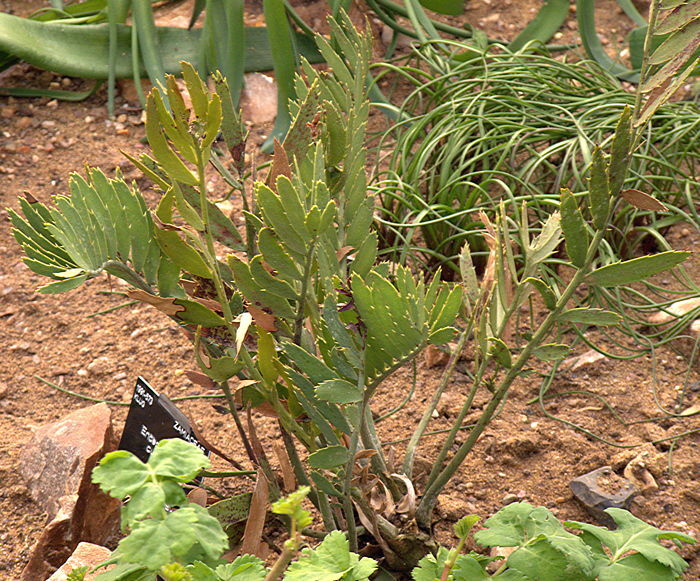 Only a single male plant was ever found, but has been propagated by cuttings of basal offsets so that there are many clones growing in botanic gardens. It is thought to be related to Encephalartos natalensis. Native to Ngoya Forest of South Africa. 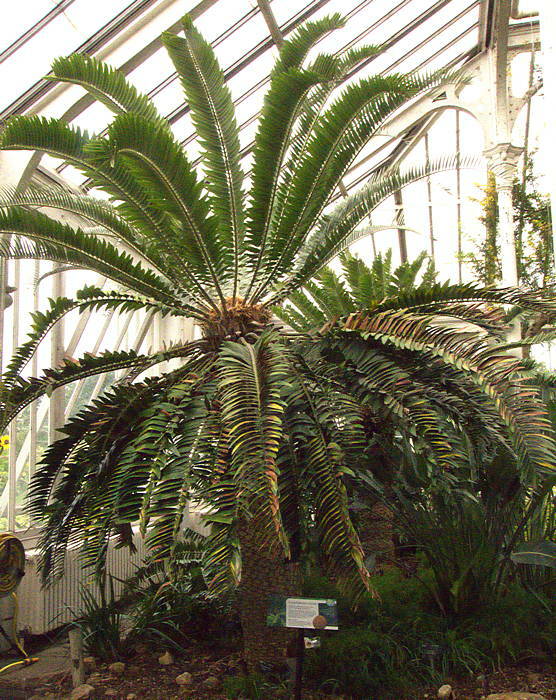 This genus includes two large species of Australian Cycad. The trunk is normally unbranched and covered with persistent leaf bases giving it a scaly appearance. These Cycads grow in rainforests of Eastern Queensland and New South Wales. Named for: Louis Hope (1817-1894) sugar cane planter, pioneer of the Queensland sugar industry. This may be the tallest species of Cyad, with the potential to grow 60ft high. 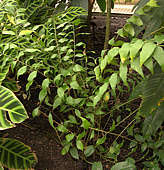 The bipinnate 10 ft long leaves have over 150 lanceolate leaflets. Dead leaves are persistent. The 2.5 ft female cones produce bright red oval seeds, which although very poisonous were processed by aborigines into food. Named for: Count Peroffsky, Russian benefactor of the St Petersburg Botanic Garden. This species makes a large tree although smaller than L. hopei. Native to the North coast of New South Wales and South-Eastern Queensland. Most of the approximately 40 species in the genus Macrozamia occur in Eastern Australia in New South Wales and Queensland but one species is native to the Northern Territory and three species are from Western Australia. All species have dark green, palmate fronds arising from a central trunk. In some species the trunk is very short or subterranean. Macrozamia is distinguised by pinnate leaves in which the leaflets have numerous parallel veins but lack a midrib and have a coloured swollen base. Lower leaflets may be present as spines. Leaves are interspersed with cataphylls and are pubescent especially when young. The sporophylls are arranged spirally in the male cones. The female cones have megasporophylls terminating with an upward spine. Despite their toxicity to humans and livestock, several species of Macrozamia were used as food plants by Aborigines. The starchy seeds are extremely poisonous and considerable masceration in water over a period of a week, with several changes of water, was needed to remove the toxins. The resulting pulp was used as flour to make cakes. The leached toxins were used as fish poisons. 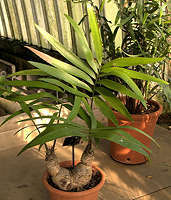 The caudex is mostly subterranean but can extend above ground as a short trunk in old plants or where the substrate is impenetrable. Native to the open forests along the Eastern coast of New South Wales, extending inland to the slopes of the Great Dividing Range. 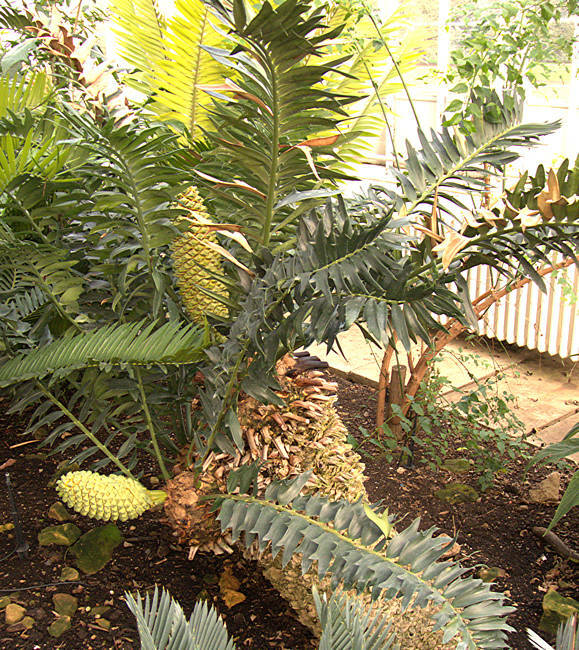 The common name 'Burrawang' really belongs to this plant although it is often applied to other species of Macrozamia. The toxic yellow to red seeds were processed into flour by the Aborigines. 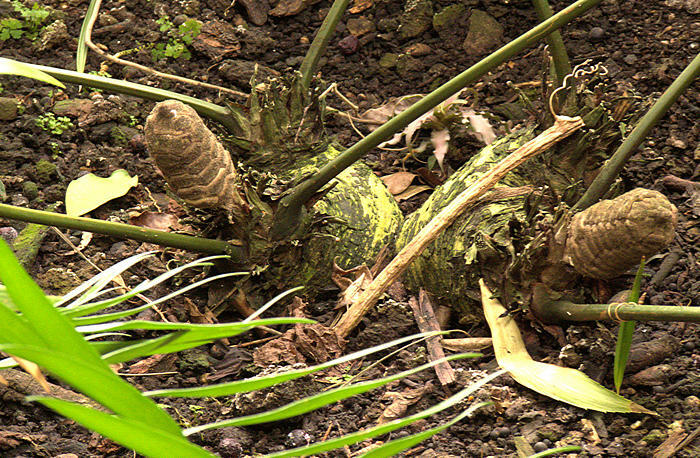 The caudex is mostly subterranean but can extend 2 - 3 ft above ground in old plants. Native to coastal Southern Queensland and Northern New South Wales. Named for: Charles Moore (1820-1905), director of the Royal Botanic Gardens, Sydney. Macrozamia moorei is the tallest Macrozamia with a massive 3ft diameter trunk up to 20 ft tall and covered with persistent leaf bases. The arching pinnate leaves up to 8ft long have numerous narrow leaflets arranged in a V-shape along the midrib. The lower leaflets degenerate into spines along the short petioles. Male and female cones are on separate plants. The barrel-shaped female cones contain many large scarlet seeds, which are extremely poisonous. However, Aboriginals made flour from the seeds after lengthy soaking in water to remove the toxins. Native to central Queensland. 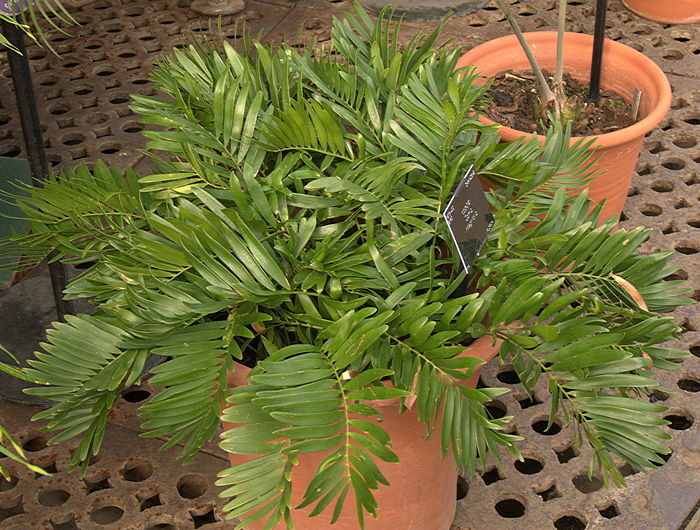 This very slow-growing Cycad is propagated as a conservatory plant or for landscaping in Mediterranean climates. This genus is monotypic for Microcycas calocoma from Western Cuba. This Cycad develops a stout 30ft trunk topped with feathery, pinnate dark-green leaves up to 4ft long supported on spineless petioles. The leaflets droop down from the mid-rib. Distal leaflets are of a similar size to those in the middle of the leaf, conferring a characteristic truncated appearance. The cones are cylindrical, yellowish-brown and hairy with two apical projections on each sporophyll. The 2 in long eliptical seeds are reddish. Native to the forested lower slopes of mountains in Western Cuba but endangered through land clearance so the total population may consist of as few as 600 plants. 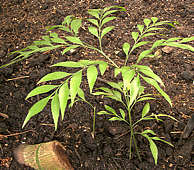 The roots are traditionally used to make rat poison. Name: Greek azaniae = "pine cone" Latin zamia = "pine nut"
The genus Zamia includes about 50 species of small, shrubby Cycads, with a palmate appearance and stout stems which may be subterranean or up to 20ft tall. The stems are crowned with spirally-arranged pinnate leaves with a degree of pubescence on younger leaves. The broad leaflets lack a midrib, and have subparallel dichotomous venation. Petioles may have spines. 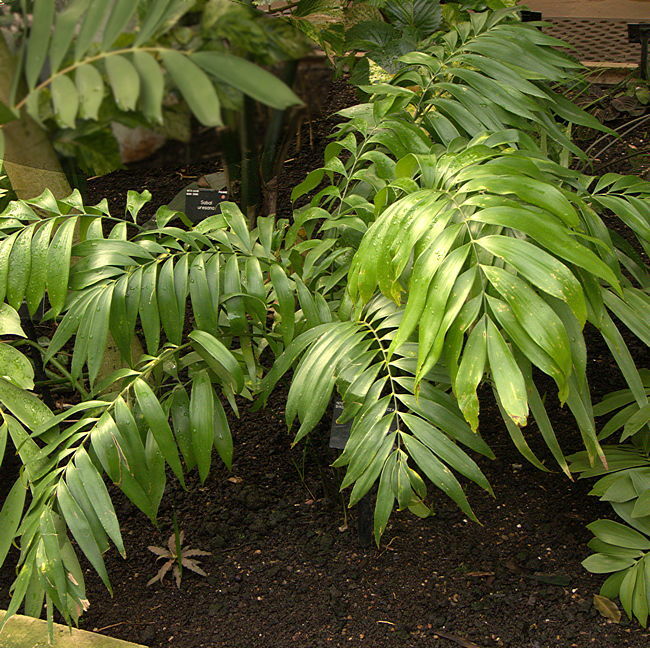 Zamia picta is noteworthy for variegated leaves with pale speckles. Zamia pseudoparasitica grows as an epiphyte on trees. Mature plants produce cones with vertical rows of sporophylls. Seeds are fleshy and globular to oblong in red, orange to pale yellow. 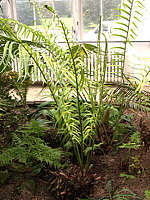 Members of the genus Zamia are native to a wide range of both North, and South America with most species coming from Central America. 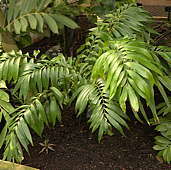 Zamia integrifolia grows as far North as Georgia and Zamia boliviana as far South as Bolivia. Most species grow as understorey plants in warm humid rain forests and are not frost hardy. Name: Latin furfuracea = "mealy, scurfy"
The short, partly subterranean trunk is crowned with stiff pinnate leaves composed of up to twelve stiff, pubescent leaflets, sometimes with toothed tips. 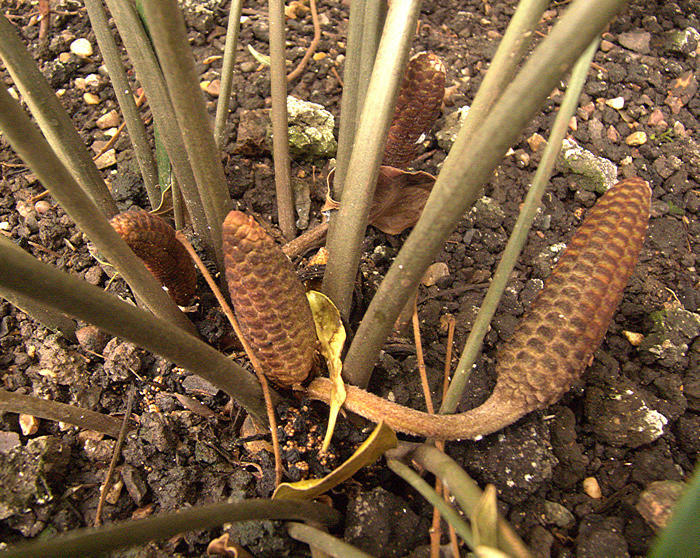 Mature plants produce redish-brown cones in the centre of the plant. Pollination is by the belid weevil Rhopalotria mollis. Female cones produce fleshy, crimson-coloured seeds which are very poisonous if ingested. Native to the Mexican state of Veracruz, growing in sand dunes where it tolerates some salt spray. A slow growing plant when young but tolerant of cultural conditions. 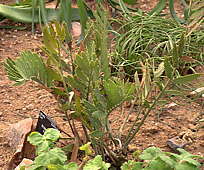 May tolerate very light frosts, with regrowth of damaged leaves. 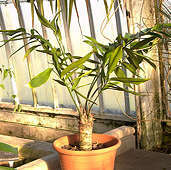 This species is widely grown as a houseplant. All parts of the plant are poisonous if ingested, causing liver and kidney failure and paralysis. There is no antidote. Name: Latin integrifolia = entire + folium = leaf, refers to leaf margins without teeth (not quite correct). Seminole Native American conti hateka = "white flour root" -> Coontie (or koonti). 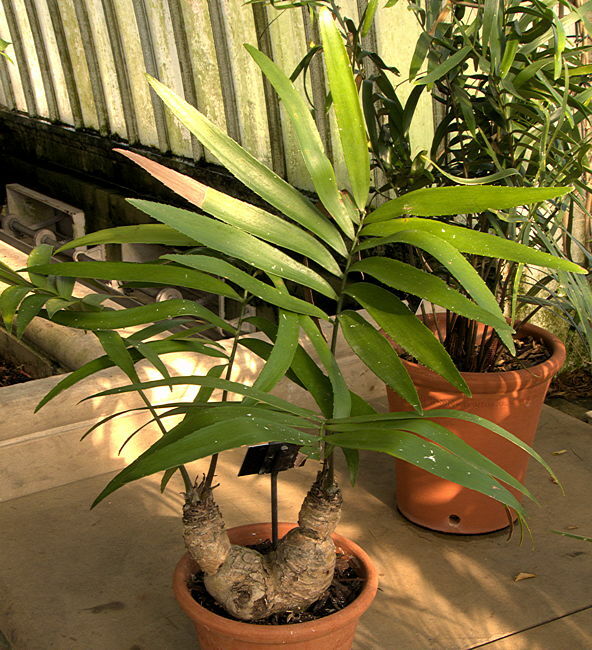 Zamia integrifolia has a short 10 in trunk, often mostly subterranean, and a substantial tuberous root. The stem is crowned with pinnate leaves formed from up to thirty pairs of lanceolate leaflets which may have indistinctly toothed tips. Petioles are often prickly and young leaves are covered in reddish-brown hairs. In a temperate climate the leaves can be deciduous during cold periods, making this species relatively hardy to light frosts. Separate plants produce clusters of cylindrical male cones and ovoid female cones. 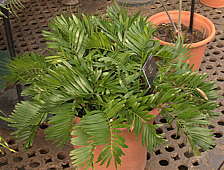 Zamia integrifolia is the only Cycad native to the South-Eastern USA, growing on limestone or sandy soils as far North as Florida and Georgia. Also native to the Bahamas, Cuba, Grand Cayman, Hispaniola, and Puerto Rico although populations have been depleted in parts of the original distribution. Some authors split this variable species into others e.g. Zamia floridana, Z. augustifolia, Z. floridana, Z. pumila, Z. silvicola, and Z. umbrosa. All parts are poisonous if ingested, especially the fleshy red seeds. However, the common name refers to use of the Coontie, with considerable processing, to make an edible starch. 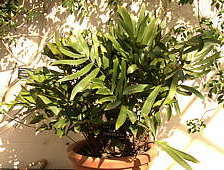 Zamia integrifolia and related Zamias are the sole food plants for caterpillars of the endangered butterfly Eumaeus atala. Named for: Conrad Loddiges, English nurseryman. This Cycad has a small, usually subterranean caudex bearing up to 6 pinnate leaves supported on spiny petioles. The stiff leaflets are lanceolate with slightly toothed margins. Native to sandy soils at modest elevations in Eastern Mexico and Guatemala, where it is common but threatened by habitat loss. A drought tolerant plant suitable for xerophytic landscaping. The short stem, branching with age, produces a crown of up to six upright leaves which increase in length and number of leaflets as the plant matures. This is a relatively fast-growing plant, becoming mature with production of cones after 5 - 6 years. Native to low-level rainforests of Colombia and Venezuela where it grows as an understorey plant in wet clay soils. This small plant has a short trunk producing up to ten pinnate leaves with small prickles along their margins and prickles along the petiole. Very similar to Z. skinneri from which it was separated, but is smaller and with fewer chromosomes. 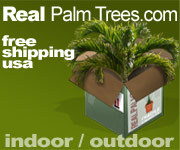 Native to low-altitude tropical rainforests of Costa Rica, Nicaragua and Panama. Needs moist but not soggy soil. Named for: Mario Vazquez Torres, Mexican botanist who discovered this species. 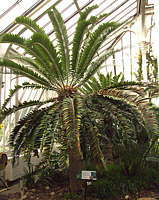 A small Cycad with a subterranean trunk producing a crown of 3 ft pinnate leaves with more than 12 pairs of leaflets with toothed margins and small spines on the petioles. Similar to the smaller Z. fischeri, from which it was segregated. Z. fischeri has fewer, smaller leaves with less than 12 pairs of leaflets. Native to pine - oak forests in the Northern part of the Mexican state of Veracruz although severely depleted in its habitat.